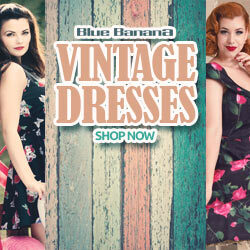 Bluebelle is a Singapore-based vintage inspired clothing company run by sweetheart owner Ammy. She began the company in 2013 because she and her sister, vintage lovers that they are, had trouble finding vintage inspired clothing to wear in Singapore. She began by stocking established European repro companies on her website, then branched out into producing her own Made By Bluebelle line last year. Her Lady in Black tea dress was so well received that European stockists began requesting to stock the piece themselves, a turn in the tables of her position of just a couple years prior. The line, originally catering to the petite sizes of ladies in Singapore, is now looking to branch out their sizing to include UK sizes 14 – 18. Their original hit Lady in Black tea dress is the first piece in the range to be extended. Given its classic modest cut and simple yet elegant floral print, I can see why.